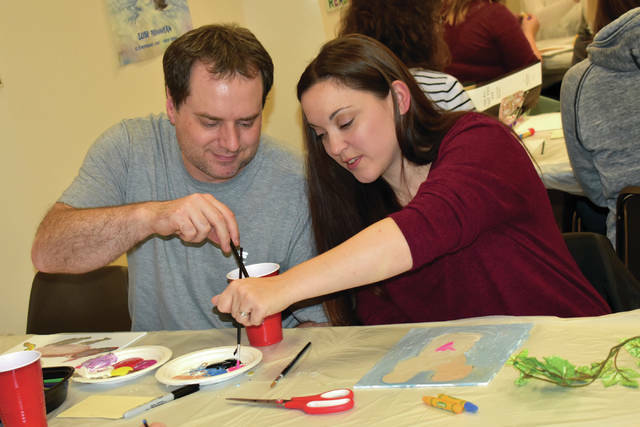 Cody Willoughby | Troy Daily News Steve and Heather Mader, of Troy, create works of art during “Bad Art Night” on Thursday at the Troy-Miami County Public Library. 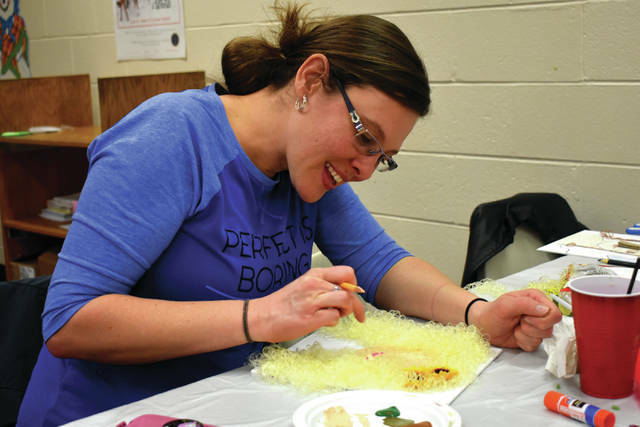 Cody Willoughby | Troy Daily News Jennie Woodall, of Troy, constructs a masterpiece during “Bad Art Night” on Thursday at the Troy-Miami County Public Library. TROY — Miami County residents were invited to come and unleash their inner awful artist during the Troy-Miami County Public Library’s “Bad Art Night” on Thursday. The event was free to pre-registered guests, with all supplies provided by the library. “Bad Art Night” was previously hosted at the library in December 2017, and was organized by Adult Services Manager William Schlimme. Between the two occurrences of the event, pre-registry increased from approximately 13 to 25. All participants were given access to multiple tables of art supplies, including canvas board, paper, paints, and various craft and coloring items. Participants were then allotted 55 minutes to make their artwork. According to Schlimme, the goal for all art was “to try to make it as ugly as possible.” At the end of the evening, all in attendance voted for the ugliest art, with prizes handed out to the winners. For more information on library events, visit www.tmcpl.org. https://www.tdn-net.com/wp-content/uploads/sites/21/2019/01/web1_BadArtNight1.jpgCody Willoughby | Troy Daily News Steve and Heather Mader, of Troy, create works of art during “Bad Art Night” on Thursday at the Troy-Miami County Public Library. https://www.tdn-net.com/wp-content/uploads/sites/21/2019/01/web1_BadArtNight2.jpgCody Willoughby | Troy Daily News Jennie Woodall, of Troy, constructs a masterpiece during “Bad Art Night” on Thursday at the Troy-Miami County Public Library.